Join us for a wet, sandy, adventurous, fun-filled week! Check out 2018 camps at ptmsc.org/camps. PTMSC members receive $10 off each registration (use promo code MEMBER when registering). If you are not yet a member, we invite you to join today to enjoy this and many other members-only benefits! 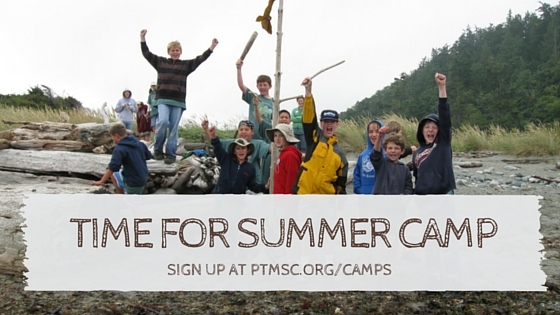 If you have questions about any aspect of camp, please email us at camps@ptmsc.org or call us at 360-385-5582 ext 120. In the event that you can’t make it to camp, PTMSC is happy to refund 75% of the full cost of camp retaining a 25% cancellation fee provided the cancellation request is made at least 30 days prior to the start of camp. After that date, no refunds are made.